$29.95 Originally. On Sale Now. A study conducted at the Washington University School of Medicine in St. Louis confirming that plant sterols do result in lower LDL cholesterol levels. The findings appear in the American Journal of Cardiology. The FDA has recently determined that phytosterols is safe and effective. The FDA recommends a daily dose of 650 mg. CHOLEST-END provides 937 mg of Phytosterol Complex in each serving. Our unique formula of Phytosterol contains Beta-Sitosterol, Campesterol, and Stigmasterol. The plant sterols only attach themselves to the LDL ("bad") cholesterol. Since plant sterols are not absorbed by body, the plant sterols and LDL ("bad") cholesterol are flushed out of the body. The HDL ("good") cholesterol is not affected by the plant sterols. Cholesterol is a waxy fat (lipid) carried through the blood by lipoproteins. The two main types of lipoproteins are high density lipoproteins (HDLs) and low density lipoproteins (LDLs). HDLs (good cholesterol) carry LDLs (bad cholesterol) away from artery walls. 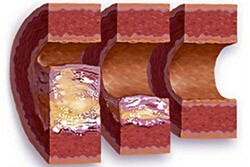 LDLs stick to artery walls and can lead to plaque/fat build up (atherosclerosis). This causes the passages to narrow making it more difficult for blood to flow through. Plant sterols work similar to HDL cholesterols by attaching themselves to the LDL cholesterols. Since plant sterols are not required within the body they are eventually dispersed, along with the LDL cholesterol. As more plant sterols are consumed overtime, less LDL cholesterol is being absorbed. Thereby plant sterols help reduce the bad/LDL cholesterol levels overtime. Diet and exercise are also beneficial to your body in fighting bad cholesterol, but sometimes it may not be enough. That is why CHOLEST-END may help. Rather than taking dangerous medications, CHOLEST-END can provide all-natural results. How Long Should I Take Cholest-End? Cholest-End is taken daily with two small easy to swallow capsules. Each bottle of Cholest-End contains a 1-month supply. Although Cholest-End may work quicker from one individual to the next, we recommend you use Cholest-End on a daily basis for the recommended period of time. After consistent use for at least 3-4 months, you should begin to see and feel results. You will achieve continued results the longer you are on the product. Be sure to order an ample supply. Natural medicine is designed to create a holistic balance within the body and can take time to propagate through your system. Be patient stick with it...you’ll be glad you did!